Setting up truly flexible design processes becomes an important challenge to face with the increasing complexity, the shorter time to market constraints and the constant evolution of Real-Time Embedded (RTE) software requirements. One promised solution is the model driven development (MDD) based on the principle of separating the application description from its platform specific implementation. Nowadays, this is often done through dedicated model transformations which implicitly represent the platform model. Specific transformations have shown their limits as soon as we want to optimize the implementation. In this context, a good compromise could be to make explicit a platform model. 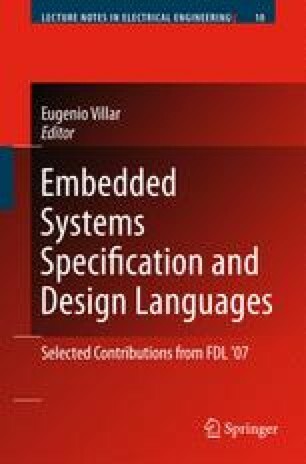 This is one of the challenges addressed by the Object Management Group (OMG) through the definition of the standard profile for Modeling and Analysis of Real-Time and Embedded systems (MARTE). In particular, the capabilities to model software real-time embedded resources will allow describing explicitly the RTE software multitasking platform characteristics. It will ease their integration in a flexible design process (both to produce implementation and to perform accurate scheduling of performance analysis).